Occasionally Coherent | Any actual sense is an unintentional lapse. First, a few process concerns. I signed up a month or two ago for “Rail Vision”-related email. I did not receive any notice of this meeting, or indeed about any other Rail Vision activities. There was no agenda mailed out that I saw; I only found out what was going to be discussed by continually refreshing mbta.com until the event listing started showing more information. The project web site does not identify who the members of the Advisory Committee are nor their affiliations. This made it particularly difficult when I was writing up my notes this evening as many of the speakers did not identify themselves. It seems pretty fundamental for any public body, even if a mere Advisory Committee, to have a public membership list so that members of the public who attend the meeting know who is being represented. From the agenda, it appears that you were discussing something today you called the “Tier 1 Evaluation”, which again does not seem to be public — the committee members were complaining about not having had enough time to read the documents and there’s again nothing on the official project web site. This makes it very difficult for members of the public to determine whether there is any value in attending the meeting or what particular issues they should raise with the people who represent their interests on the committee. My overall response, despite these process concerns, is that I’m cautiously optimistic, based on the comments I heard from all the committee members today, but I am somewhat concerned that you may be, in the words of the great architect Daniel Burnham, “making small plans”. Given that the rail system is going to require a substantial public investment, it is absolutely vital that this “vision” be a truly forward-looking one, a world-class rail system for our world-class city — we the taxpayers are going to have to be convinced to pay for it, and minor tinkering around the edges while traffic and service get worse for a decade or more is not going to do that. Ask for the best system you can justify, independent of resource constraints, and if we have to make some compromises to pay for it, make sure taxpayers, legislators, and the governor know that we’re settling for less than what we deserve. As I said at the meeting, the one way forward that actually addresses all of the committee members’ goals — which should be everyone’s goals — of fast, frequent, reliable, all-day, bidirectional rail service, is system-wide electrification with fast, lightweight Electric Multiple Units. The very least we should aspire to is “at least as good as Helsinki”, and given that the Boston-Providence CMSA has five times the population of metropolitan Helsinki (and very similar population densities in the suburbs) this really shouldn’t be that great an ask. There was a lot of talk specifically about growth in and service to the 495/MetroWest corridor, perhaps because many of the committee members are from that area. I actually spent all of Veterans Day weekend researching and writing a specific proposal for this region, where I personally have lived for 17 years. The project should include in its universe of possible service expansions initiating service at least as far as Marlborough on the Agricultural Branch. See the publication list below for more information and motivation. In response to Josh at T4MA: (Sorry, Josh, we don’t need a bar car, we need to shave half an hour off your commute from Worcester.) In all seriousness, bar cars — any distinct type of coach, especially a non-powered coach — is Bad with a capital “B”. Save those for the east-west intercity service. With only minimal upgrades, the proper EMUs should be able to cut the Worcester express’s running time to 50 minutes, while still serving all stations within Boston city limits. This then eliminates the need for the terrible “Heart to Hub” service and regularizes rush-hour schedules for the entire line. Josh also calls for “flexible trainsets”: this is really an argument for modern, long (75 to 80 meter, 250 to 267 foot) articulated EMUs — not something 1850s-rail-car-sized like the Metro-North EMUs. Then you’re adding/subtracting passenger capacity in units of 250-400 passengers (depending on design and fraction of standees) rather than 160-passenger coaches. This also means you can easily, quickly, and safely make and break consists on the platform to ramp capacity up and down as needed. While my comments were mostly in agreement with former Secretary Aloisi’s statement, I wanted to disagree with him on one point (which I didn’t raise at the meeting for time reasons): as a Framingham resident, I don’t support the concept of A/B testing service patterns with EMUs on the Providence Line and diesels on the Worcester Line. To get the track capacity required for the level of service we want and deserve, you need the power and acceleration that only EMUs give you. However, Sec. Aloisi is absolutely right on the need for Allston Viaduct mitigation, and I have argued and will continue to argue that this is an ideal demonstration environment for hybrid battery EMUs. The gap between Yawkey and Boston Landing, during the Allston construction, is too long for a train to coast through, especially considering that the low clearances at Beacon St. will prevent energizing catenary there until all the bi-levels are gone from the South Side. A battery system with sufficient capacity to power the EMU at reduced speed for the 2½ miles from Yawkey to Boston Landing would not add too much to the weight of the vehicle — and such a vehicle would also have operational benefits elsewhere, during service disruptions and construction projects where catenary must be de-energized. 1. There is a large investment of some sort required in commuter rail infrastructure over the next ten years. Either we can spend billions of dollars to keep the service limping along as it has been, or we can spend only slightly more to replace it with a vastly superior service. The longer the Commonwealth delays action, the more money will be wasted on keeping the obsolete equipment and the obsolete service running. 3. Work on the I-90 Allston interchange is scheduled to start in 2021. While it’s unlikely that we could have full Regional Rail on the Worcester Line before then, MetroWest and Worcester commuters need mitigation — practical commuting alternatives during the anticipated eight-year construction period — which the current commuter rail service is far from being able to provide, and the sooner we get Regional Rail implemented on the Worcester Line, the more effective a mitigation strategy it will be. While it might not be ready for 2021, there is every reason to believe we could have a full implementation by 2023, only two years into construction, if the right decisions are made now. Schedule thoughts: if we decided to do this, really seriously, with a board vote in January, then the MBTA could start issuing design-build contracts for Providence and Fairmount Line improvements and electrification late in FY19, have an RFP for rolling stock in the spring of 2019, and issue the rolling stock contract (about $2–3bn) in about a year from today (say, October 2019, so early FY20). Pilot cars (if Stadler is the chosen vendor) could be delivered by ship from Europe about a year later, call it January 2021, just in time for the completion of PTC implementation and AFC 2.0. Get a dozen pilot cars and test during winter and spring of 2021, and you can introduce them to revenue service on Providence and Fairmount lines in time for the summer 2021 rating, and take delivery of 30 more cars a year, every year, from the US assembly plant once the pilot cars are accepted. Meanwhile, you let a single design contract for the remaining catenary and substation construction, and a separate contract for all platforms, with biddable design packages for the Worcester Line due by summer 2020 at the latest. Separate station improvements contracts for Back Bay, Newton, Wellesley-Natick-Framingham, and west-of-Framingham, so that you can start service to Framingham by late 2022 and to Worcester in early 2023. At that point, the newest commuter coaches and locomotives get redistributed to the other lines, and the oldest equipment can be sold for scrap rather than being replaced. Oh, and you should build my Framingham-to-Northborough proposal. I am releasing the presentation to the public under a Creative Commons Attribution-No Derivative Works 4.0 International license, but with a special exception that excludes presentations based on these slides from the “no derivative works” clause, even if recorded or transcribed. This is basically to protect me, in case someone decided to release a maliciously altered version of the slide deck without my permission, but it’s also why there is only one photo in the presentation (because I would have had to go out after work, in the dark, and take the pictures myself). So please do feel free to use these slides, in whole or in part, to give a presentation on the subject to people you have a connection with, or if you’d be interested in having me actually give the presentation (mind: my only qualifications are as someone who wishes he could take the commuter rail), please see the contact information on slide 62. I need to thank a bunch of people whose blog posts, blog comments, tweets, and private communications provided important information, and in some cases corrected misconceptions of mine, including Zachary Agush (@zagush), Sandy Johnston (@sandypsj), Alon Levy (@alon_levy), Ari Ofsevit (@ofsevit), David Perry (@FramWorMBTA), Ted Pyne (@Ted4P), and a number of anonymous railfans. However, all of the opinions expressed and any factual errors in the presentation are mine alone. 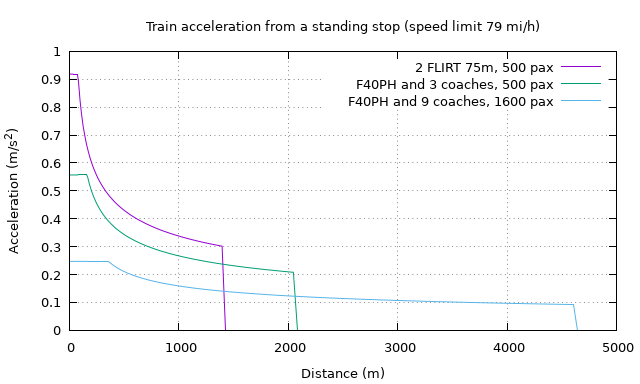 UPDATE 2019-10-26: Updated to respond to Alon Levy’s comments on Twitter, and correct the power and maximum acceleration for the 75m FLIRT based on the Stadler data sheet. See the GitHub repo for more details and comments regarding the limits of this simulator. This past week I’ve been working on a slide deck that people can use to present the Regional Rail concept to non-transportation-nerd audiences, and one of the things that I wanted to include, just as an aside, was a couple of slides explaining the “stop penalty” and why it’s so bad for traditional diesel-hauled commuter rail like we have in Boston. 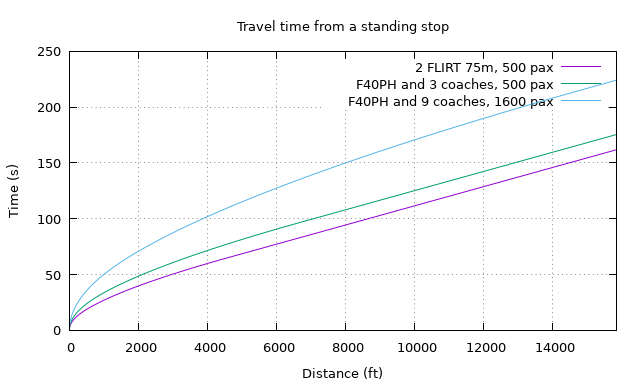 This led me down a horrible rabbit-hole for the better part of two days, trying to figure out a closed-form expression that would allow plotting comparisons showing speed over time, or distance over time, or speed over distance. I am quite certain that there actually is such a solution, but I couldn’t come up with one that looked believable when I plotted it out, so I went back to square one and wrote a simple numerical simulator that would just generate the data points I needed to make my plots rather than trying to come up with the general formula. 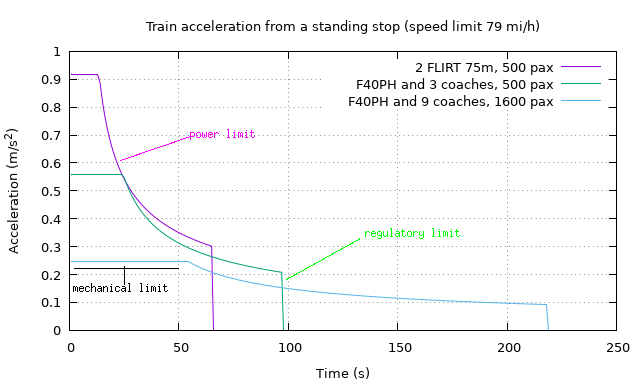 If we assume that you always want your train to accelerate as fast as it can until it reaches the speed limit (or until it has to slow down for the next station), then when we are in this power-limited regime, and (where is the maximum force the motor can exert in the forward direction, called “tractive effort”) when it hasn’t reached maximum power yet. In both equations, is the mass of the entire train, including locomotives, coaches, fuel, and all the passengers. Note that in the energy-limited regime, acceleration is a function of velocity — in fact, it’s inversely proportional to velocity. Acceleration is the first derivative of velocity, which means this is a differential equation; luckily it’s one that has a solution, although as I said I had trouble figuring this out (because I never took Diff. Eq. in college, most likely) and couldn’t figure out how to do the integration piecewise — because what we really want to figure is speed as a function of time, and then integrate that to get distance traveled as a function of time. But just to make things clearer, here’s a plot showing the three different regimes for three different train configurations that I set up in my numerical model. The three train configurations modeled are two trains with 500 passengers, all seated — one with my favorite articulated EMU (Electric Multiple Unit), the Stadler FLIRT, and one with a diesel locomotive of the type the MBTA uses and three bi-level coaches — and a third diesel train with the same locomotive but a nine-coach consist and a crush load of 1600 passengers (the highest load and the longest train currently operated on the MBTA). I assume that all coaches are bi-levels because I don’t have a source for the mass of a single-level coach: in actual operation, at least one single-level coach is required in every train for accessibility. The code for the simulator is in my GitHub repo, in the file physics.rb. The slide deck will be posted here once I finish writing it. I’ve written here a few times in the past about the prospect, under Regional Rail, of operating passenger service on the former Agricultural Branch Railroad through Framingham. Twitter user @h100gfld convinced me to take another look, and I identified a number of potential station locations and traced out the length of the line on aerial photos. To run service all the way to downtown Clinton, a relatively old, and therefore dense, Worcester suburb, you would need to reconstruct and twin most of 24 miles of track, including building new signals and electrification, some of which will be in an environmentally sensitive area (the flood plain of the Nashua River near Wachusett Reservoir), which would be unlikely to cost less than $10 million a mile in addition to the nine stations. I had another nice Twitter discussion with Sandy Johnston, a planner at MassDOT, about how you model reverse-commute service into areas like this, which currently have a heavily car-dominated mode structure: understanding the potential for some of these stations requires a good model of how transportation demand management can operate in highly suburban areas of the metro. A station where there are already private shuttles (operated by individual employers, office-park developers, or Transportation Management Associations) or public transit services (operated by the MBTA or a local agency) would have more reverse-commute potential than a parking lot surrounded by undevelopable conservation land, even if the latter is actually the location of a historic passenger station. However, as @h100gfld pointed out, there are a number of locations along the Ag Branch with significant potential for “traditional” commuter rail services. But let’s at least look at the “traditional commuter rail model” for the Ag Branch, and what that would imply about where you want to put stations. As it’s practiced today, you’re looking to intercept car commuters convenient to their residence or close to a major highway, and give them a big flat parking lot (cheap) or garage (expensive) to park on. This means that you tend to avoid putting stations in the historic downtowns they used to serve (and which would provide potential for TOD or have existing destinations desirable to travelers) — as witness the Westborough, Southborough, and Ashland stations on the Worcester Line, which are located well outside walking distance from anything other than their own parking lots. It also means that you don’t want to build stations on separate lines “too close” to each other, because the federal funding paradigm only rewards new riders, not riders diverted from an existing station by the addition of a more convenient station. This was one of the conclusions from the last time the Ag Branch was studied as a potential commuter rail line: it would not draw enough new riders, but rather, it would just take riders away from the Framingham Line. Because the Ag Branch service was viewed as “competing” with the Worcester Line service (which had not yet been restarted at the time of the study), it was not advanced out of preliminary study into more formal planning. Of course, there have been many, many changes in both land use and transportation (not to mention congestion) since then which mean that the conclusions should be revisited. Since the time of that study, the branch continuing through Nobscot into Sudbury (the former South Sudbury Industrial Track, part of the former Framingham & Lowell Railroad) has been abandoned and tracks lifted — and even more unfortunately, the branch from Marlborough Junction to downtown Marlborough, which is now something of a destination in itself, has been totally obliterated by development. One thing the Regional Rail paradigm gives you, even for a relatively peaky, commuter-oriented service, is a lower stopping penalty — thanks to electrification, all-door boarding at high-level platforms, and lightweight, quick-accelerating electric multiple-unit trains, adding a station stop typically means less than a minute in travel-time penalty for through passengers. That means that you can have both downtown stations and big park-and-ride interceptor lots where the traffic justifies them, and with frequent all-day service, travelers who are parked at a P&R can get off at a downtown station to shop or dine without having to worry about being stranded there waiting for infrequent off-peak or reverse-peak service. This then leads me to a route map for passenger service on the Ag Branch that I created in Google My Maps. This map shows nine station sites, two of which are redundant with each other. The map also shows an approximate half-mile “walkshed” around each station location, indicating which businesses and residents would have car-free access to the train. Take the Suburban Propane facility off Simarano Drive on Cedar Hill St. for a large surface P&R lot a half mile from I-495. Note that I did not put a station at Marlborough Junction, although there is surely room for one, because there simply isn’t anything there: the Simarano Dr. location would be more convenient for most drivers and there are neither walkable destinations nor much in the way of residences near Marlboro Jct. This is a location that would be a prime candidate for an infill station if Marlborough either committed to funding shuttle service to downtown or changed zoning to encourage high density around the potential station location. I’ve moved the platform north from what I think was the original station location to put the north end of the platform close to Southborough Medical Center. I would rename the existing Southborough station to Cordaville, which is the historic name of the neighborhood, so that the station in the center of Southborough can be named “Southborough”; the two stations are just about three miles apart along Route 85. Note that even though the Cordaville station is not convenient to the Turnpike or I-495, its large P&R lot regularly fills up before 7 AM on weekdays, so there is justification for building a new station that would attract traffic from the northern part of the current station’s commutershed. I’ve discussed this station location frequently in the past. It’s within walking distance of Bose corporate headquarters and a large Sanofi (Genzyme) facility, and has existing MWRTA shuttle service; it’s just off Route 9 and at the Mass Pike interchange; on the other side of Route 9 is Staples corporate headquarters. All told there are probably five thousand jobs in this area, plus a big hotel, and the whole industrial park is ripe for higher-density development made possible by frequent rail service. I’ve illustrated two possible station locations for Framingham State University. Both are located at existing FSU parking lots and have site limitations that restrict platform length, but this whole line is probably limited to 600-foot platforms at best. (With the equipment I’ve proposed, that’s more than enough to carry 500 passengers per train, and with service every 15 minutes at peak that would be more than enough to meet the demand on this line.) The northern station location is at Salem End Road, very close to the grade crossing at Route 9. 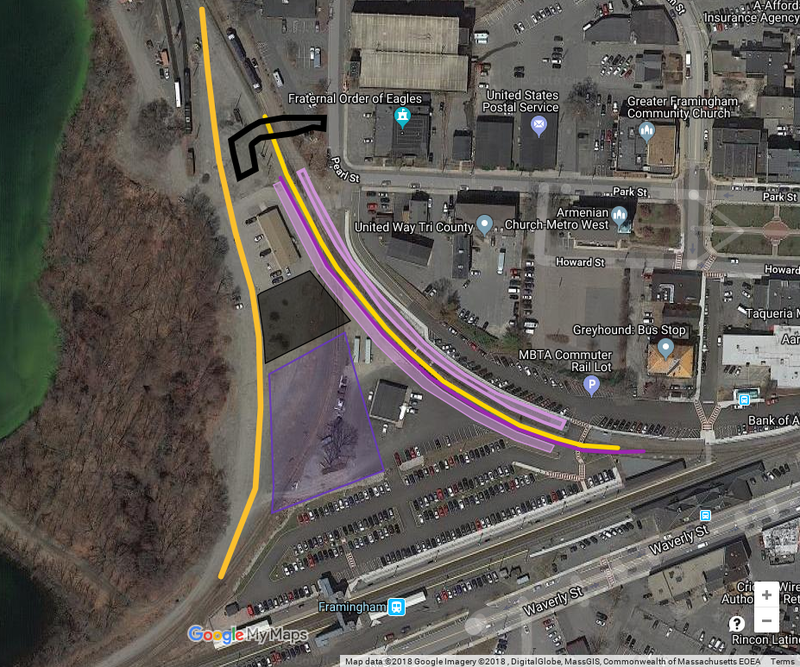 It’s the clearly superior location in terms of access to Framingham State’s campus and to other businesses and residences in Framingham Center, but if a grade separation needs to be built over Route 9 it might not be constructible. The second Framingham Center station is south of Maple St. and just north of the existing bridge over the Sudbury River. You could possibly justify building a station at Mount Wayte Ave. instead, or building both Salem End and Mt. Wayte (the north end of the Salem End station site is about 7/8 mile from Mt. Wayte Ave.) but if so, it should be paid for by the owner of the shopping center on Franklin St. Maple St. is within walking distance of more residences than Salem End Rd., which tends towards the commercial, but I think there’s a stronger case for Salem End if you can actually build it. In terms of priorities, I would build this project in four phases: phase one is to Tech Park, phase two is to Simarano Drive, phase three is to I-290, and phase four is the rest of the way to Clinton, probably at least 20 years out unless someone can make a compelling case for doing it faster. At South Framingham it becomes the “local” train for the Framingham/Worcester line, so it would probably require two-trainset consists at peak. I modeled this assuming the track is reconstructed for 59 mi/h service; getting to 79 mi/h saves a whole two minutes so I doubt it’s worth the added capital investment.